I have chosen one image from a series of photographs by Michael Wolf. The first thing that struck me when I first saw this image was the presence of intense pain, struggle and suffering of the subject staring out at us from behind the glass. We view the portrait through a filter of water droplets which are on the inside of the space which the focus of the image occupies. We do not know the nature of this space but the presence of the moisture is suggestive of a humid, oppressive environment calling our attention to the discomfort of the subject. This then leads us to believe that she is being kept in harsh conditions, perhaps even against her will. The backdrop is dark, implying an unhappy, unsafe location and indeed, the subject looks troubled. 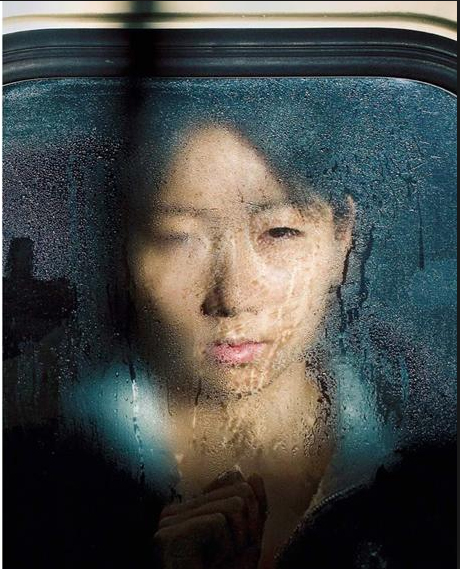 Michael Wolf began his career as a photojournalist and the reason I have revisited this image from his series Tokyo Compression, is because I have been reminded of it in recent years. There have been many ‘similar’ images in the media in the reporting of the desperate plight of the Syrian refugees, all of whom are trying simply to escape danger and keep themselves and their families safe. The photograph that I have chosen here is not that of an individual from a war torn community or of a desperately frightened refugee fleeing danger, but an image from a series of portraits of city workers on their daily commute on the subway in Tokyo. The subjects of these photographs, which I find compelling, are certainly likely to be suffering; that is of course by today’s standards of those of us living a relatively mundane, but almost certainly a safe life. The anguish felt is that of the everyday grind of the chore of the monotonous repetitiveness of going to work to pay the bills. I can’t help but observe how this image presents a somewhat over dramatic alternative to the actual reality, in the same way as what often currently happens on social media. Perhaps, though, this has more to do with the viewer and how we are conditioned by the copious amounts of shocking images we are flooded with in our news feeds and timelines today.